We are pleased to share with you new programs, developments, or accolades. Check back here often to see what is happening with Bell Curves and find useful tips and information about our programs and services. Co-founder of Bell Curves, Akil Bello, discusses his "7 Biggest Business Mistakes"
Hashim and Akil Bello honored by Black Enterprise Business Report as Entrepreneurs of the Week. Akil Bello, Co-founder of Bell Curves, interviewed on National Public Radio's News and Notes. Listen in as Akil discusses Bell Curves and the test preparation industry. 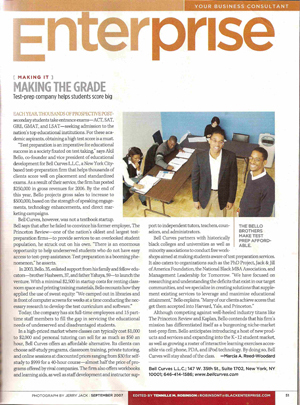 Bell Curves is featured in the September 2007 issue of Black Enterprise Magazine. Click the article to read the full story.